Fourth-generation farmer Bradley Coppinger became the first person from the Cannon County FFA to earn the prestigious Star Farmer Award when the honor was bestowed upon him during the spring. Coppinger is a rising sophomore at MTSU. Bradley Coppinger easily could be the poster person for Woodbury FFA. Coppinger, a fourth-generation farmer and former Cannon County High School student, became the only person from Cannon County ever to win the Tennessee Star Farmer Award when he received the honor from the FFA during the spring. The Star Farmer Award is the highest honor bestowed on individuals by the FFA. It represents the best of the best and finalists have mastered skills in production, finance, management and/or research. "It says a lot because it talks about how outstanding of a member you are in your chapter and in FFA, and it says a lot about your farming program," said Coppinger, who is majoring in agribusiness and minoring in finance at MTSU. "It is pretty much the highest award given in FFA so it was an honor to receive the Star Farmer Award." The ambitious Coppinger, son of Phillip and Jennifer Coppinger, is a farmer in the Red Hill community of Cannon County. He already owns his own equipment, runs a successful business and harvests various crops. "Bradley is an outstanding leader who I've seen grow into a leader of this community over the last four years," said Courtney Nichols, agriculture teacher and FFA advisor at Cannon County. "He has his own farming program. Bradley has started small and very efficient and has expanded it through the last four years. 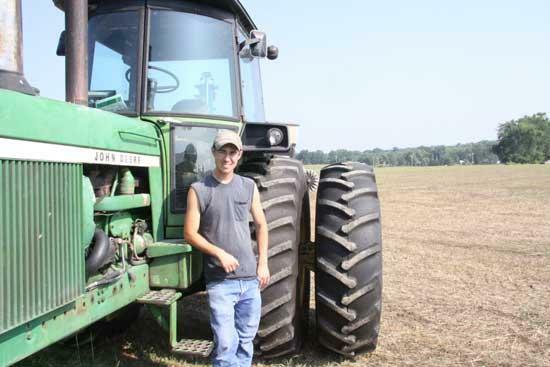 He's a well-rounded individual and farming is his passion." Coppinger likely could have taken many different paths. He graduated fourth in the Class of 2010 at CCHS and, during his basketball-playing days, he was named MVP of the Cannon County Tournament as a standout performer at Woodland. But Coppinger was born to farm. His grandfather, Glen Coppinger, is a farmer and so is his dad, Glenn. Any doubt that Bradley would follow in the footsteps of his mentors was put to bed shortly following his high school graduation. "A lot of times when kids graduate from high school they buy a new car or truck," Bradley suggests. "When I graduated I bought a new 4020 John Deere tractor. We needed a new one and that's always been my favorite so that's what I bought." Phillip Coppinger swells with pride when asked about his son and the successes he has already enjoyed in the farming industry. "When something tears up Bradley falls right in there fixing it," Phillip points out. "There is a lot of pride seeing him do that. You can trust him to do anything and you can always figure it is going to get done. Farming his is first love. His mother and I are very proud of him but the old guy is probably more proud of him." The old guy is the man Bradley calls "Pa." His grandfather may actually be credited with saving Bradley. "I was 5-years-old and my mom put me in pre-K at MTCS," Bradley recalls. "I was there for a week. My dad worked a full-time job in Nashville and farmed part-time and my Pa had a drywall business and farmed. Evidently, I cried about being sent to preschool so my Pa retired from his drywall business and decided to farm full-time. This way I didn't have to attend preschool and I was able to stay with him and farm all the time. That's probably where it all started for me." By the age of 7, Bradley had started driving a truck with seed to the planter. By age 10, he was operating a tractor in the fields. At 12-years-old he was operating a combine and at 13 he started with the planter. "All his life Bradley has watched the crops grow so he knows the importance of harvest time," Nichols said. "As Bradley's crops matured, so did he, and his responsibilities grew tremendously. He took over the maintenance of equipment and began his own farming enterprise." Coppinger's SAE consists of 450 acres of leased land for soybeans and corn and 60 acres of wheat. He also has 120 acres of hay that he harvests and sells to the public. In 2010, Coppinger rolled 40 acres of hay for the public. "I've tried to expand and diversify everything out, not just sit on corn, soybeans and hay, but maybe get into the cattle business" Coppinger explains. "I'm trying to diversify and grow gradually and not take on a big chunk all at once. I try to watch what others do and take notes." Coppinger also was the top individual scorer in the FFA Tennessee soil judging event and reached the National Convention for his work. "Bradley's love for field crops sparked his interest in the soil, resulting in becoming a four-year member of the soil judging team," Nichols said. "He was the second-highest individual in region competition and the highest individual in state competition, and he earned a trip to the National Soil Judging Competition." Coppinger was also the state winner in Diversified Crop Production and received National Silver in this award area. He credits his association with FFA for much of his development. "If you have an interest in farming then FFA is worth it," Coppinger said. "I benefited from it through high school. I was able to meet different people, gain knowledge, talk to people, improve my speaking through public speaking events, just so many things. FFA helped me a lot to have my own business. I felt like knowing what I do here has helped me. (Nichols) and (agriculture teacher and FFA advisor Bob Melton) really helped me and pushed me. I think they could tell I was a hard worker and tried not to walk away from anything." Coppinger served as Chapter President of the Woodbury FFA and was a member of the Dairy Judging, Agriculture Sale, Floriculture, Forestry and Farm Business Management teams. He has attended three National FFA Conventions and four state conventions. He is a member of the Woodbury FFA Alumni.